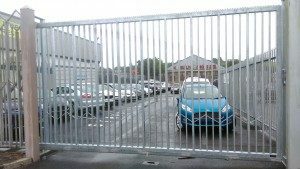 So today we are fitting a sliding security gate at a car dealership in Waterford city. We were called to this premises shortly after they had experienced an unfortunate break in.Some people broke in and started a mini bus, which they then used to force the existing swing gates out,so they could steal a valuable car which was being kept in the storage yard. Some times there is not a lot you can do to stop people who are determined to get in.We advised the garage owners to fit a sliding gate instead of replacing the damaged swing gates.A sliding gate is a lot more secure as it is held at either end when closed and locked.Two swing gates have a weak point in the centre.They are fine for a domestic entrance but not as secure for a business premises. 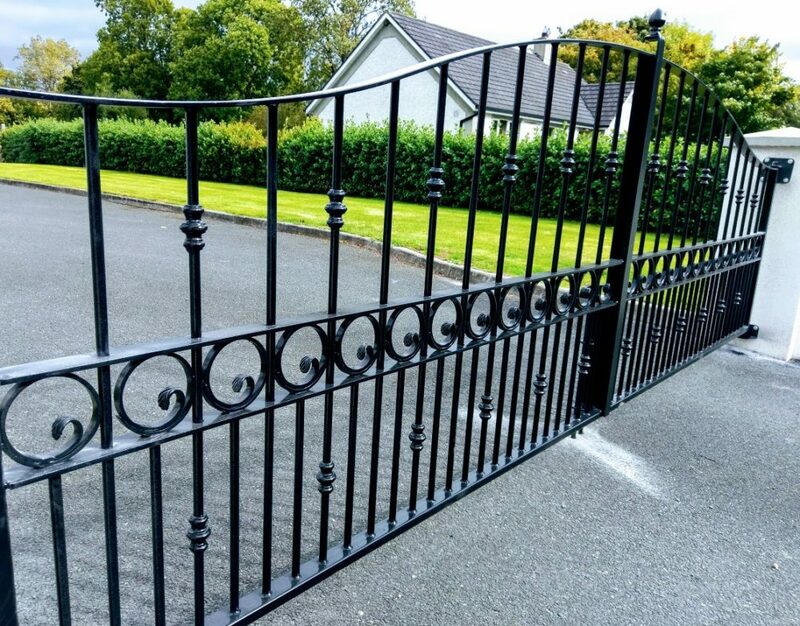 We decided to keep to the original design of the gates as much as possible,while making a few small changes to prevent anyone climbing over or tampering with the locking mechanism. Our first job was to fit the concrete plinth to hold the cantilever gate mechanism.Once we had this done we were in a position to start fabricating the new sliding gate.The most important things to take into account on a job like this are to make sure the gate is strong enough to withstand any attemts to force it in or climb over it.We fabricated the gate and sent it off for galvanising.As I mentioned in previous posts all our gates are galvanised as a minimum standard to prevent rusting. Once we received the sliding security gate back we fitted it to the cantilever system.Everything worked perfectly.Our clients were delighted with their new sliding gate.Following an inspection, their insurance company were completely satisfied with the new gate. Next week we are fitting a lovely old style set of wrought iron entrance gates. This entry was posted in Installations by webadmin. Bookmark the permalink.